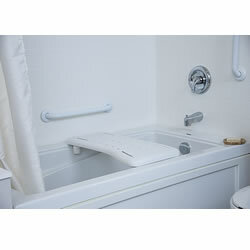 HealthCraft Products Bath Board provides a secure place to sit for bathtubs that don’t feature built-in seats. The sturdy plastic seat makes washing, along with entering and exiting the bathtub, safer and easier. It features anti-slip friction feet that are easy to adjust for different widths of tubs. This helps to stabilize and secure the bath board without damaging your bathtub surface. The Bath Board can be removed from the tub when not being used. Please note: By law, hygiene-related products cannot be returned. Due to this fact, we recommend that you discuss your specific needs with an Adaptive Living Representative and your personal healthcare professional(s) BEFORE purchasing any hygienic product. This item is a NON-RETURNABLE hygiene-related product.